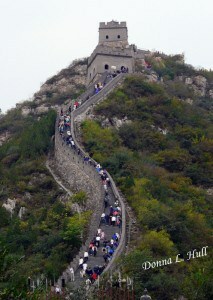 Visiting the Great Wall of China is a a challenge, if you’re a baby boomer with a fear of heights. The experience proved to be one of my biggest travel disappointments. The pictures that I had seen in books, and on the internet, showed a remote setting with few people around. Although, I knew that the wall traveled over steep terrain, none of my research prepared this baby boomer for just how steep and deep the stairs would be, or how crowded. Alan and I stopped by the Juyongguan section of the Great Wall while on a Regent Seven Seas cruise bus excursion from the pier in Tianjin to our Beijing accommodations at the Regent Beijing Hotel. Later, Jane Yeo, our private guide in Beijing, told us that we had visited one of the more popular gates of the Great Wall, probably to accommodate tour bus parking plus provide restroom and snack facilities for a large number of people.